To improve the chemical resistance of non-isocyanate polyurethane (NIPU), two kinds of diglycidyl ether, bisphenol AF (E-AF) and perfluorooctyl glycidyl ether (PFGE), were selected to synthesize two different cyclic carbonates, bisphenol AF (EC-AF) and perfluorooctyl cyclic carbonate (PFGC), respectively. These cyclic carbonates were successfully used to prepare fluorine-containing non-isocyanate polyurethane coatings. The effects of PFGC amounts on the properties of NIPU were studied, and it was found that the contact angles of water, diiodomethane, and hexadecane were increased with the addition of PFGC and up to 106.7°, 80.2°, and 72.7°, respectively, whereas the pendulum hardness of NIPU coatings relatively decreased with the increase in PFGC contents. The NIPU coatings exhibited excellent flexibility, adhesion, and impact resistance. They also displayed good thermal stability with 5% weight loss temperature (T5%) ranging from 249 to 271°C. 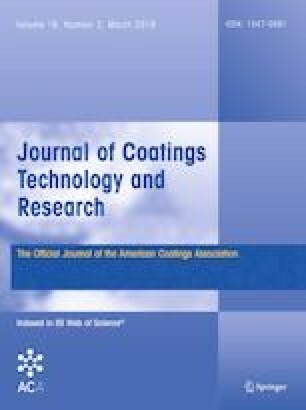 Moreover, these coatings possessed very low water uptake, excellent hydrophobic/oleophobic properties, and corrosion resistance properties. This work was financially supported by the National Natural Science Foundation of China (No. 21878109), and the Science and Technology Program of Guangdong Province, China (Nos. 2015A010105010, 2015B090925006, 2016B090930005, and 2016B030302004).